Wow, these Iron Orchid Transfers are the bomb! If you have not used an Iron Orchid Transfer – you should consider doing so! They give you the look that you spent hours and hours hand painting a design or some typography, but really…all it took was about 30 minutes of your time. They are easy to use and will bring your painted pieces to a higher level! Iron Orchid Transfers come in all different designs. Some are a charcoal color and some are white. Obviously, the base color you are applying them over will dictate which color transfer to use. 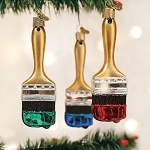 They are great to use on walls, furniture and other wood pieces. They should be applied BEFORE you apply your chosen top coat like wax or hemp oil. 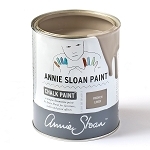 These work beautifully over Chalk Paint® or Milk Paint. You need to be patient when transferring them though. As you rub the back of the transfer and slowly – pull the transfer tape away- make sure that the image has taken to the item you are applying it to. If it has not, lay the transfer back down and carefully rub more. We have a couple videos on how to apply the transfers. Here is one from a Facebook LIVE that we did on December 11th, 2017 showing Courtney and I applying one….check it out HERE. We also have a Youtube video HERE for you to watch also. The Facebook LIVE video shows how we cut the transfer when placed over multiple drawers. Sadly- we ruined a small amount of the stencil, but went back in with an artist paint brush and some white paint and “fixed” what we tore. Once you have carefully applied the transfer, then you can apply your top coat. At The Purple Painted Lady- our top coat of choice, is wax. Check out our Facebook Video HERE where we show you how to apply the White Miss Mustard Seed Wax over the Artissimo and Transfer. We used an Annie Sloan Wax Brush and Scott Shop Towels to remove teh excess wax. We do some crazy things at The Purple Painted Lady and try to keep it fun! This workshop qualified for both! 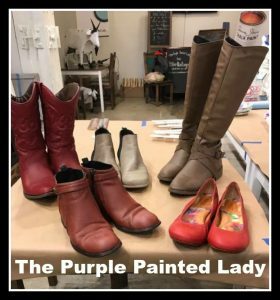 We hosted a “Paint Your Own Shoes Workshop” and we had everything from ballerina slipper shoes to cowboy boots brought in to be painted using Chalk Paint® by Annie Sloan. The secret to painting your shoes- is similar to painting fabric. 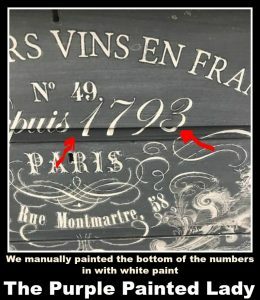 You want to thin your Chalk Paint® with some water. Since shoes do not require much paint, we poured about a 1/8 of a cup in to a plastic glass and then added a tablespoon or two of water and mixed it well. You want to thin the paint, BUT NOT to the paint it loses it covering ability. In the image above, you can see the inside of the boots that I painted. The boots are a faux leather and I bought them at Target. in fact, in 2015 – it seemed cowboy boots were all the rage in western NY, and I purchased a few pairs of the same boots since the quality and price was right! 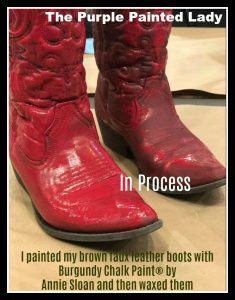 They did not come in a “red” and I always wanted a pair of red cowboy boots…so I made them myself. You need to be patient when painting shoes or fabric / leather couches and furniture. You thin your paint with water so it is not super thick – especially because we want it to be flexible for the change in shape a shoe or boot goes through when we physically walk. Is this a permanent – life long solution? Yes…and I also have a bridge to sell you too! No, lol…but it is an option that will last a good while though. 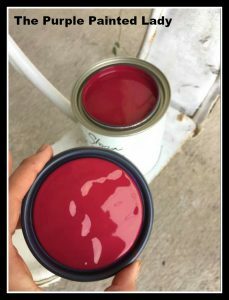 I chose to use Burgundy Chalk Paint® by Annie Sloan. In my photo above – you can see the boot on the right in the drying process and how the color darkens as it dries. 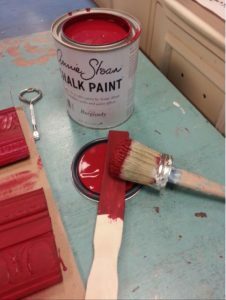 Annie Sloan defines this color as a rich deep warm red the color of dark cherries. Most of Annie’s colors are 18th and 20th century inspired but this one comes from the 19th century when the discovery of Alizarin Crimson made this color possible for the first time to a large number of people. It is now one of the classic colors used in particular for neo-classical painted furniture. The Purple Painted Lady has found Burgundy to be interesting, in that the color appears to almost be like a bright berry color when wet, but the shade changes to a Burgundy when it is dry. 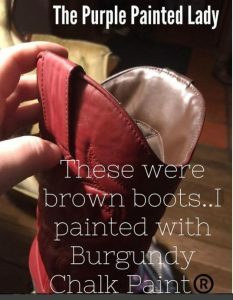 I painted my boots with three coats of thinned Burgundy and then did two coats of Annie’s Clear Wax. I applied the wax with a lint free rag and I used the same amount of pressure that you would if putting eye cream around your eyes….meaning a delicate touch! I also was gentle to remove the excess clear wax, and my hand glided over the surface when I was done. I recommended to everyone in the class, to give their newly painted shoes or boots a couple days to be alone so they can cure and to hold off wearing them for a few days. If interested in taking a workshop with The Purple Painted Lady®- check out our shopping cart under workshops HERE.